In celebration and anticipation of Reinhardt University’s School of Performing Arts spring musical, “The Secret Garden,” Reinhardt will proudly welcome Tony Award nominee Rebecca Luker to campus for a free concert and masterclass. Luker will bring her talents and share advice with Reinhardt University School of Performing Arts student, as well as members of the public Feb. 11 at 7:30 p.m. in Flint Hall at Falany Performing Arts Center. Through her masterclass, she will perform, talk about her experience creating her role in the show, and offer a talk-back to Reinhardt’s students and community about her career. Students she will be speaking to are preparing for their own production of “The Secret Garden” in Reinhardt University Theater Feb. 21-Feb. 24 and March 1-3. Tickets are on sale at Reinhardt.Tix.com. Luker was born and raised in Birmingham, Alabama before she took her place on stage in New York. She has performed all over the United States with various symphonies and been in many productions both on and off Broadway. 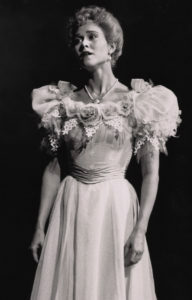 In addition to her role in the original Broadway cast of “The Secret Garden” as Lily, opposite Mandy Patinkin, who appears in “Criminal Minds,” “Homeland,” “The Princess Bride” and many other TV shows and movies, Luker’s success continued with Tony Award nominations for “Mary Poppins,” “The Music Man” and “Show Boat.” She also appeared in the Tony award production of “Fun Home” in 2015 on Broadway.